"This is a nice change from ordinary French toast. I make this more than the standard recipe. Although this is my family's favorite version, it is very versatile. You can substitute peanut butter for the cream cheese, use different jams or preserves, different extracts or spices - the options are practically limitless! 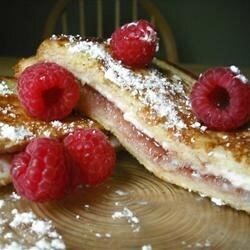 Serve with maple syrup and sprinkle with powdered sugar." Spread 4 slices oatnut bread on one side with cream cheese. Spread remaining 4 slices on one side with raspberry jam. Press cream cheese slices together with jam slices, forming sandwiches. In a medium, shallow bowl, beat together the eggs, milk and almond extract. Melt butter in a large, heavy skillet over medium high heat. Dip sandwiches in the egg mixture to coat. Place in the skillet, and cook on both sides until golden brown. This recipe was a big hit!! I used french bread and blackberry fruit spread. I also topped them off with powered suger. Yummy!! We loved it! We added 2 Tbs. or so of white sugar to the cream cheese (whipped it up) then spread it on the bread slices. We also used regular wheat bread and it was still good! All I can say is "yummy"! My husband even liked it and I was afraid it would be too sweet for him. I used Raspberry Simply Fruit and it was delicious. Really Yummy! I had to try it with Hawiian sweet bread. Filling and wonderful. I will make this again and again. I might even try it will my other favorite fruit fillings!!! I enjoyed these a lot! I used Multi-grain bread, lowfat cream cheese and grape jelly. Yum!